Service Oriented Architecture (SOA) requires a new way of looking at integration between subsystems. The primary subsystems of interest on z/OS are CICS, IMS, and DB2. There are many ways to integrate WebSphere Application Server on z/OS with those subsystems. In this IBM Redbooks publication, we focus on Web Services integration scenarios and scenarios using an Enterprise Service Bus (ESB) solution. 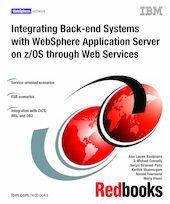 In the IBM Redbooks publication WebSphere for z/OS V6 Connectivity Handbook, SG24-7064, we elaborate on both Web Services and J2C scenarios. The scenarios in this book are described from a development perspective. In the Additional material, a workspace is included for most scenarios.